made a branch of Kracl Funeral Chapels in Schuyler. 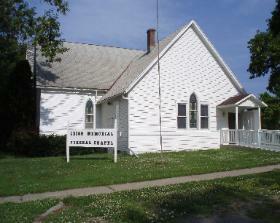 Jerry Kracl was part owner of the Leigh Chapel in 1991 and started Kracl Funeral Chapels in Schuyler in 1994. Leigh Memorial Chapel is a full service funeral facility serving all faiths. The chapel offers a comfortable setting in which families can greet friends during the visitation. The original altar of the church has been maintained and creates a beautiful setting. The chapel is handicapped accessible and has off-street parking. We are proud to once again be a part of the Leigh community.